Each knot has three points, three loops and three knots to make the one. Some believe that with the two points facing top, it is the sign of an angel. Three has been magical in many religions and beliefs. 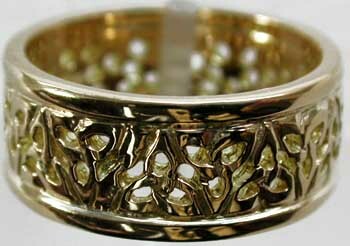 This ring is wide at 10.0 mm (8mm for ladies) with the optional trim and uniform all the way around. 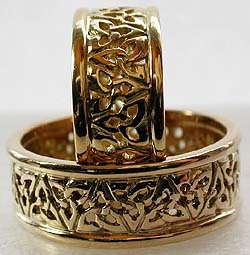 This particular combination shown at the top of the page is done in 14kt white gold filigree 7mm trinity knots with 14kt yellow gold outer bands of medium width. 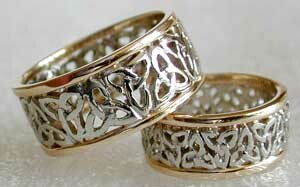 Again in threes, three rings joined to become one band. 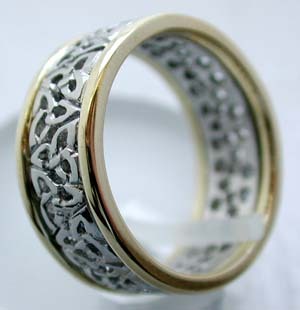 You can create yours in any combination of color, 14kt or 18kt, platinum, with or without outer rails. 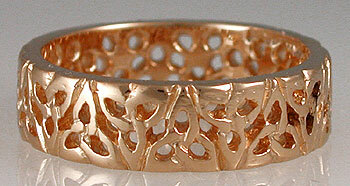 When you have your ring size taken, you MUST specify a wide ring sizer. 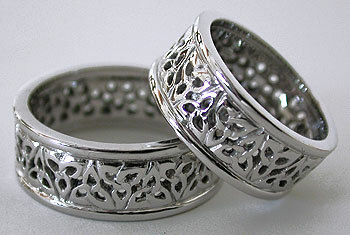 Better yet, try on a wedding band that is already 10 or 8mm wide to see how it feels. Often times with a wide band you will feel more comfort with a half size increase. Check to be sure! These are sized from the center outwards and not on the leading edge. Those three colors you see below are three separate rings. 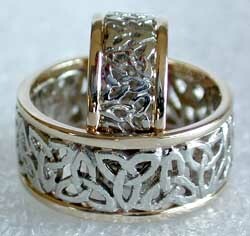 If someone tries to stretch this trinity knot band or resize it, it may become three rings again. Ireland will no longer accept returns from the USA do to an incorrect size. These are hand made custom to the way you order the selections. 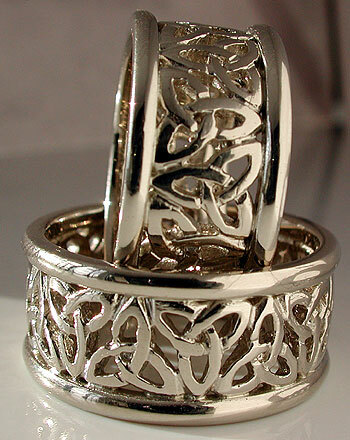 Each Celtic trinity knot band is made to order one at a time by hand in Dublin, Ireland. 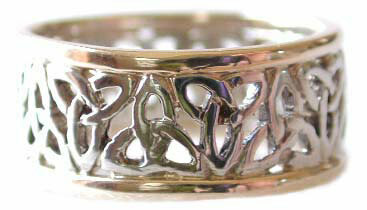 Usually delivered in 4 to 8 weeks, 8-12 weeks for platinum work. We try to have several on hand and will send one out for you to evaluate if you like. It will only cost you shipping each way and your credit card will be refunded should you decide to not go ahead and order one. 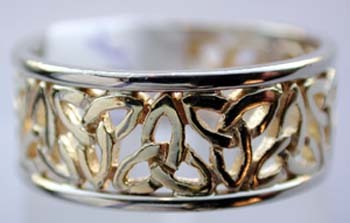 To help give you and idea of cost so you can create your own custom trinity knot ring, pricing in the first group is for the knots, the second group for the optional outer rail trim bands which is actually two more rings. Add, mix and match for your personal choice. Some of these images are blown up 10-20 times normal eyesight. It is like looking through a jewelers loupe. Remember, the trinity knot band by itself is 6mm or 7mm. Adding the trim will add 2mm more to the overall width. The extra heavy trim and twisted rope nautical trim that was exclusive to Seawear is no longer available to the USA market. 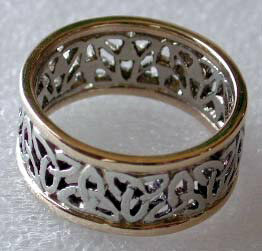 You can't tell, but this is size 6 with platinum and 18kt custom heavy trim. Weight was over 10gms! And he wanted platinum on the outside for his!